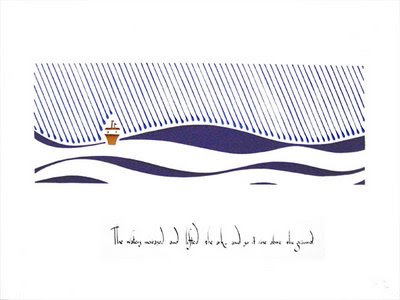 Isaac Brynjegard-Bialik: Nice Jewish Artist: Noah's Ark Papercut:"The Waters Increased"
I cut this piece as a donation for the 2009 Temple Ahavat Shalom (TAS) Early Childhood Education Center (ECEC) luncheon and silent auction, its annual fundraiser. I tried to do something true to my artistic vision (did I type that? really?) but also that would potentially bring in some cash for the synagogue. So I've got my patterns in there, of course, but it's very obvious in its subject matter. The verse is Bereshit (Genesis) 7:17: "The waters increased and lifted the ark, and so it rose over the ground."